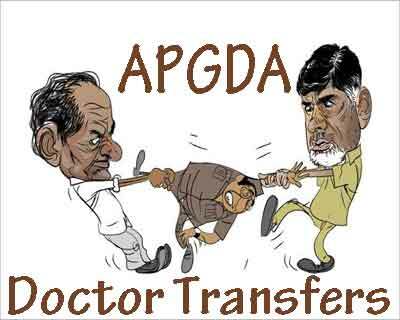 Visakhapatnam: The proposed allocation of Andhra Pradesh super-specialty doctors to Telangana has met with strong opposition from the Andhra Pradesh Government Doctors’ Association (APGDA). The doctors are reported to have held a protest demonstration against the same further alleging that the transfers are happening under the cover of absence of sanctioned posts in Andhra Pradesh. To make their protest official, the APGDA submitted a representation to Health Minister, Kamineni Srinivas on Sunday. Copies of the same were also given to the Governor , the Chief Minister and the Kamalnathan Committee. The names of the three transferred doctors from KGH-AMC who have been shifted to Telangana are: Dr LRS Girinadh, Associate Professor Gastroenterology, Dr A Mythili, Associate Professor,Endocrinology and Dr S Gopi, Associate Professor, Neurology. Dr. Jayadheer felt that these transfers were bound to create patient problems for KGH hospitals in AP, as the facilities entertain the ailing from all neighboring districts and states. He also complained of paucity of super-specialty doctors of the stream, in government healthcare facilities. Jayadheer also feared discriminatory treatment being meted out to these doctors by their counterparts in Telangana, despite they being forced transfers to the region. The Secretary, APGDA gave a clarion call saying that if the state authorities did not put a halt to these forceful transfers of AP doctors to Telangana, agitations would be led on a daily basis and black badges worn to work, to register protest against the state government’s decision. The Kamalnadhan Committee would be having a meeting with the Health Ministers & Chief Secretaries of the two states tomorrow, to decide on the final allocation of doctors in the two states. On July 12, 2016, a report published in the New Indian Express stated that the Kamalanathan Committee’s tenure had ended, March 31 and the bifurcation of combined Andhra Pradesh state cadre employees between TS and AP still lay undone. The report stated the possibility of an extension being granted to the committee to finish the allocation job. The report mentioned the reason for the delay being the medical, health and police departments not being able to furnish information and decide on the local status of the employees.The CR Kamalanathan Committee has completed tentative allocation of 42,000 employees and 16,000 employees are yet to be allocated, the press report states further. Even TGGDA ,the Telangana Doctors association also is making strong demand that all the A.P native doctors be sent back to A.P, in the bifurcation process.